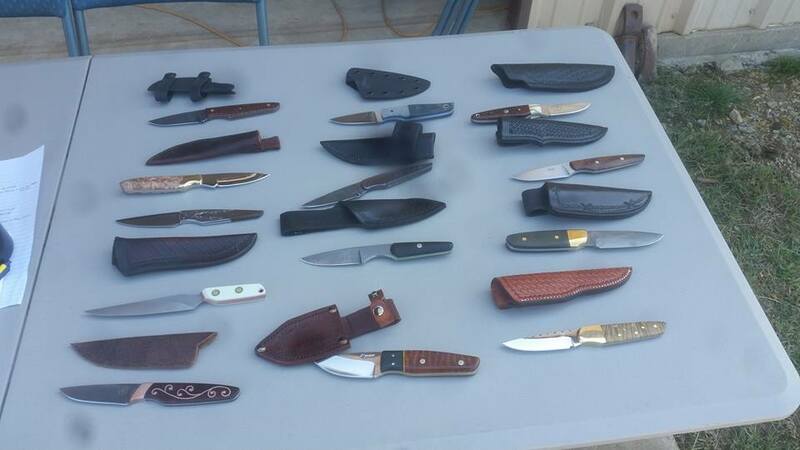 A tradition among knife makers is the knife swap known as a “Knife in the Hat.” Each maker who wishes to participate makes a knife. When all of the knives are finished, names are drawn, and your knife goes to someone else. In turn, you receive a knife from another maker. A KITH is a great way for makers to own other makers’ works without having to shell out the cash. Another benefit, and perhaps the most relevant to the TKG, is that with our exchange there is an expectation of feedback. You see, it’s rude to point out the flaws in another man’s knife unless they ask you for feedback. The KITH gives us a structured opportunity to both give and receive feedback. Step one to making a better knife is to learn to see the flaws. Step two is to learn to fix them. The KITH helps with seeing. This year all of the knives were built in one design, an everyday carry style by Travis Fry. It is interesting to see the variety in the knives, considering that they all started with the same basic profile.